The Hawks cash in on turnovers in a 74-24 victory over Lincoln Academy. His players sure weren’t. The Hawks came out fast and never slowed, running away from the Eagles 74-24 at the Portland Expo. Marshwood forward Grace Verrill and Lincoln Academy guard Joy Hedrick wrestle on the floor for the ball. Marshwood scored the first four points, then quickly pulled away. The Hawks had a 10-point lead in the first four minutes, led by 21 after one quarter and 32 at halftime. Marshwood (18-1) will play second-seeded Greely at 10 a.m. Wednesday in the semifinals at Cross Insurance Arena. The teams didn’t meet in the regular season but Greely defeated the Hawks 46-35 in the semifinals a year ago. Natalie Herbold led Marshwood with 14 points and Miranda Montgomery had 10. They combined for 15 in the first quarter, which ended with Marshwood ahead, 25-4. “That’s what we talked about all week, getting ahead early, playing hard and putting them out of the game,” said Herbold. 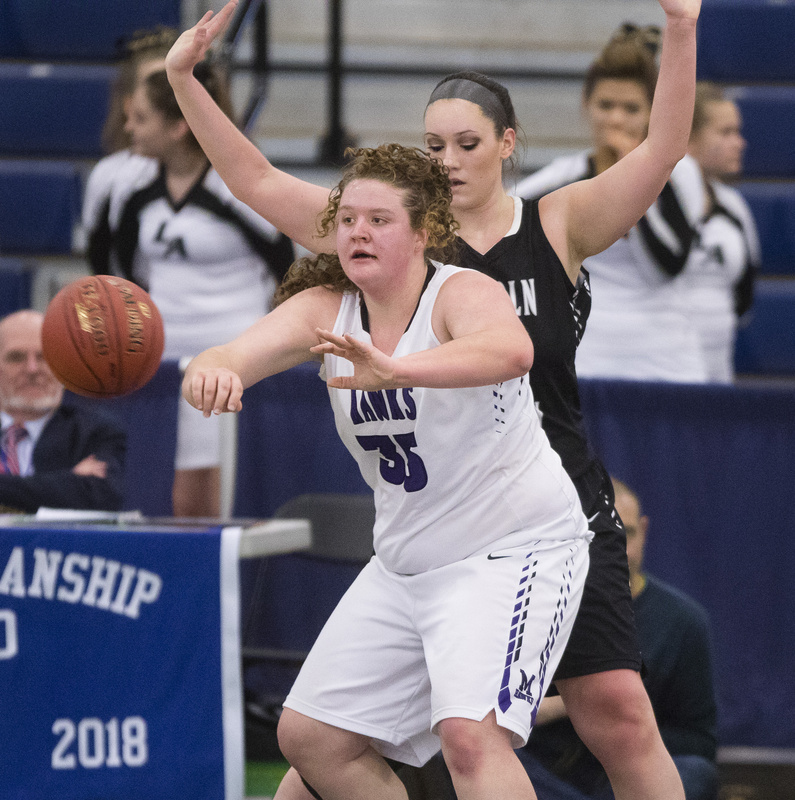 Marshwood forward Miranda Montgomery passes beneath the basket, as Lincoln Academy’s Kaitlin Feltis guards from behind. As impressive as the Hawks were offensively, their defense was exceptional. Marshwood forced 35 turnovers, 13 in the opening quarter. Lincoln Coach Kevin Feltis knew what to expect. The teams scrimmaged in the preseason and he followed the Hawks all season. 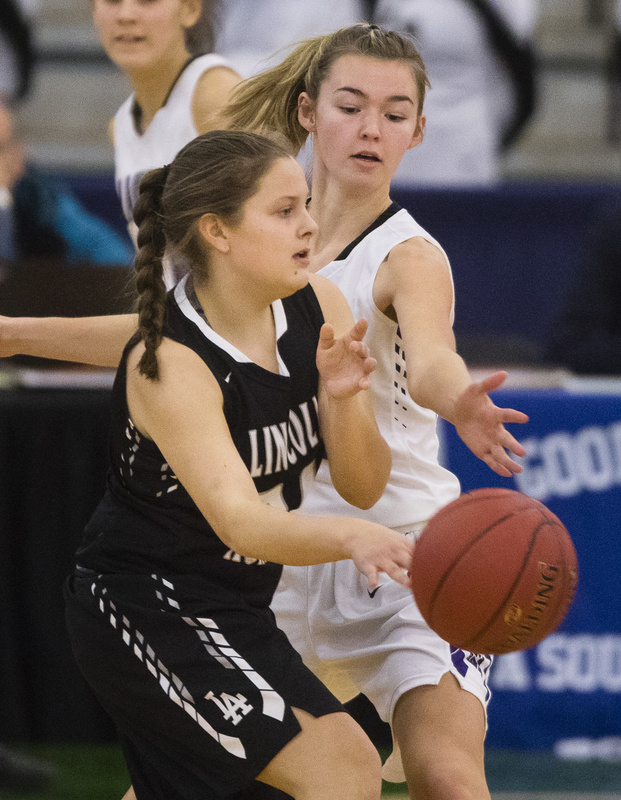 Lincoln Academy guard Madison York passes the ball while guarded by Marshwood’s Grace Verrill. Nathalie Clavett scored eight for the Hawks. Kara Anderson and Jordyn Beers each had seven. 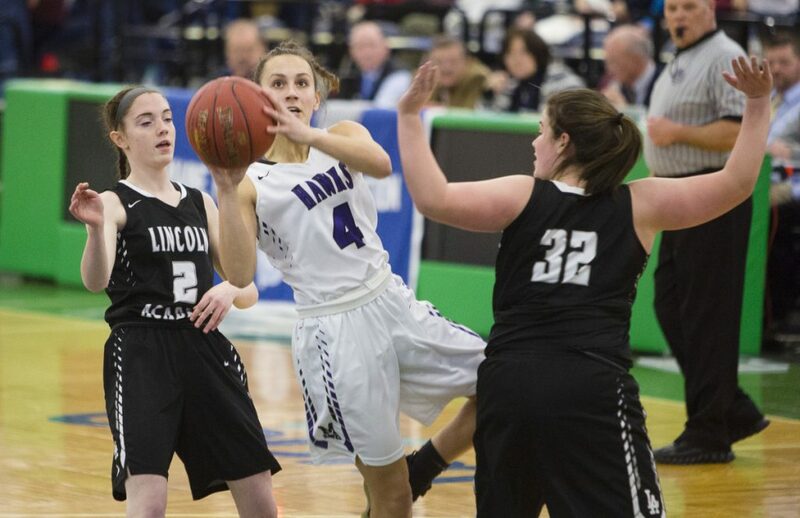 Lincoln Academy was hampered by early foul trouble but simply couldn’t handle Marshwood’s full-court pressure. Time and again the Hawks got easy transition baskets off turnovers. It was 8-3 when Marshwood went on 17-1 run to close the first. Herbold began it when she stole the ball at midcourt, went in for a scoop layup from the left, drew the foul and hit the free throw. Angelina Bisson hit two 3-pointers in the run and the Hawks were never challenged.